A Video/Performance by Kevin Atherton, to mark the programme launch of One Here Now: The Brian O'Doherty / Patrick Ireland Project (opens 20 April 2018). Followed by A Conversation on ‘In Two Minds’ - Kevin Atherton & Sarah Hayden. Kevin Atherton’s ‘In Two Minds’ was first installed at the Serpentine Gallery, London in 1978. 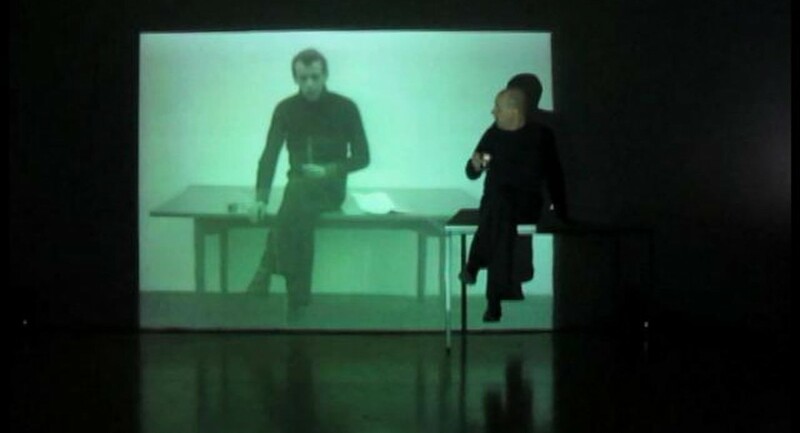 Now, forty years later, Atherton will re-enter this video-performance live at Sirius Arts Centre. The artist of 1978 will interview himself in 2018. Their cross-temporal combat will be followed by a performative interview in which Sarah Hayden will interrogate the Atherton of today. Meanwhile, a sequence of ‘Athertons Looped’ will run—for one night only—in the centre gallery. 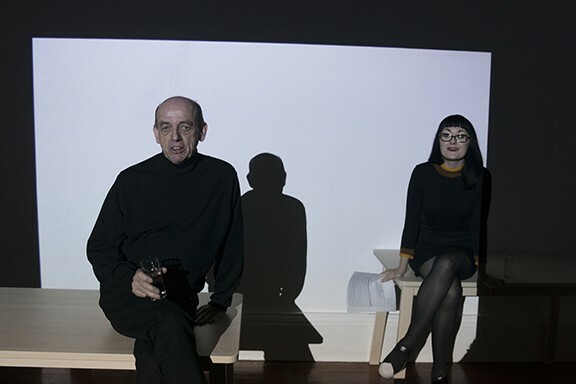 Playing with concepts of authorial control and the artwork’s relation to its audience, this event prepares the walls for the imminent reappearance of One Here Now, a series of wall murals made by Brian O’Doherty / Patrick Ireland at Sirius Arts Centre in 1996, and the closing of the centre gallery of Sirius Arts Centre as we currently know it. 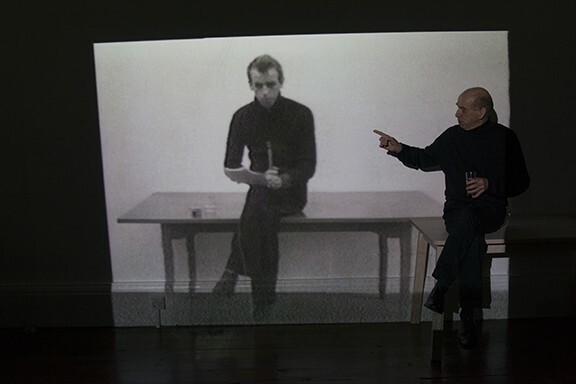 ‘In Two Minds: Interrogated’ sets up the terms for an encounter between Atherton and O’Doherty’s work. ‘Atherton After Ireland’, an exhibition conceived as part of ‘One Here Now: Brian O'Doherty / The Patrick Ireland Project 2018-19’, will take place at Sirius Arts Centre in September 2018. Comprising multi-media work from across his extraordinarily diverse career, newly commissioned pieces and a voiced intervention by Sarah Hayden, this project will be a comprehensive exposition of Atherton’s work, staged in dialogue with O’Doherty’s legacy at Sirius. Moving between video, performance, sculpture, installation, virtual reality and frequently disrupting the borders between them, Kevin Atherton’s practice consistently asks questions: of itself, of art, of its viewers. His work has been shown internationally, at venues including the ICA and Tate Britain (London), Van Abbe Museum (Eindhoven), Museum of Modern Art (Vienna), and San Francisco Museum of Modern Art (USA). The Manx-born artist’s influence on the UK and Irish art scenes—particularly on the development of video and performance art—is uncontested. His presence is provocative and, in its acute irreverence, utterly necessary. It is also, often, very funny. Sarah Hayden is a critic, writer and lecturer. She thinks about art, literature, artisthood and the points at which they intersect. The collaboration between Atherton and Hayden is a new one; ‘In Two Minds: Interrogated’ will be their first public performance together. The outcome cannot be predicted. Kindly supported by the Arts Council of Ireland and Cork County Council.